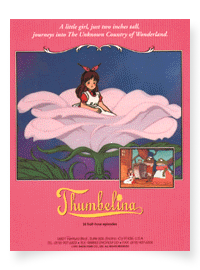 "Thumbelina" is one of the great masterpieces of juvenile literature, and is well known throughout the world. "Thumbelina" was written by Hans Christian Anderson, the king of storytellers for children. Anderson's warm and beautiful writing style conveys a world of dreams and enchantment. Once upon a time in a small village there lived a young girl named Mia. MIA was always misbehaving, upsetting her neighbors and causing her mother grief and embarrassment. One night MIA and her mother were reading a fairytale entitled "THUMBELINA." While reading the story, Mia's mother fell asleep. All of a sudden a bright light beamed from the pages. Instantly MIA was transformed into a tiny two inch girl quite like the character named "THUMBELINA" from the story book. Unable to awaken her mother, MIA enters into "The Unknown Country of Wonderland" and begins her journey through this magical fairytale land. Here you will find an exciting series, full of joy and adventure. Throughout the stories we learn the value of love, honesty, forgiveness and many important virtues. The unique and charming design of each character and the fantastic backgrounds make this new version of "Thumbelina" a sensation among children everywhere. A lovely girl born in the flower of a tulip which blooms from a seed given by the good witch. She is only two inches tall, about the size of an adult's thumb. A witch who gives Thumbelina to a woman who asks for a child. She watches over Thumbelina throughout her adventures with love and affection. A fairy who accompanies Thumbelina at the wish of the good witch. She changes into various forms and represents justice, loyalty and wisdom. They steal sleeping Thumbelina and drop her down into Wonderland. Remarkable personalities such as The Twistedman, Eggman, Violinman, Umbrellaman, Timebusters, and so on. An evil spirited man who works for the Bad Witch. He always gets in the way of Thumbelina.